In conducting these training classes, patterns have emerged that beg the question – can we present this better? Can we create a training class that goes beyond showcasing a bunch of disparate functions? Can we provide the big picture rather than get tangled in the tool nuisances? We have set out to do just that – provide training courses that not only provide instruction in an EDA tool, but to give the big picture as well. 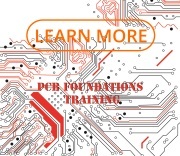 PCB Foundations - PCB Design - This training is complete overview of the PCB process, from conception to manufacturing. It was written to provide all the necessary details one needs to know. In addition to looking at the schematics and PCB from a process point of view, lesser known but vitally important topics of fabrication, assembly, DFM and specification writing are also presented. Spec Ops Training - Not all class can be offered as a standard course which addresses the needs of many and we recognized some training topics are just as important as the ones offered as a standard course. To accommodate your needs when it comes to topics of this nature, we offer the Spec Ops training series. These consultation/training courses are customized to your needs and agenda. The training can be done on-site or on-line, depending on best way to interact with you and your colleagues. Onsite Training – Why travel when the experts can come to you! Let’s face it – training, while it has a very positive long term impact, is an investment in time and money in the short term. In most cases, a significant cost of training is travel expense. It is not often that a training of interest happens to be in your local area. If you have 3 or more interested students, we can come to you at your convenience. Customized Training – We realize that some clients may have some specific training needs that just aren't going to get adequately addressed even with our various course offerings. This is especially true when it comes to tool flow, cabling, libraries, and process flow. The customized onsite training can be customized to meet the needs of your organization. Altium Designer Boot Camp – This training was developed to provide the key elements of Altium Designer to get one up and running in the tool. It is streamlined to provide information on three key features of the tool – Library, schematic and PCB editors. 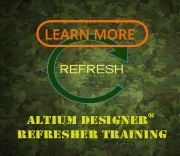 Altium Designer Refresher – This class is designed to provide a refresher training with Altium Designer Version 17 (AD17) for engineers and designers who don't use Altium Designer on a consistent basis due to the nature of their jobs. The class focuses on the areas where lack of familiarity with the tool will impede the design flow. 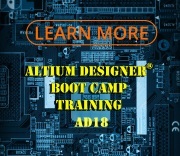 Note that this class should only be taken after attending the Altium Designer Boot Camp offered by Nine Dot Connects or has prior experience of design, layout and manufacturing of a PCB using Altium Designer. 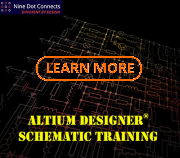 Altium Designer Schematics – This training walks students through placing schematic components from various sources into Altium Designer schematics. Students connect the schematic components and check the design for errors. PCB footprints are linked to the schematic components, as well as parameters to be placed into a Bill of Materials. Output files are rendered from the schematics (BOM and .PDF) and the Outjob file introduced. 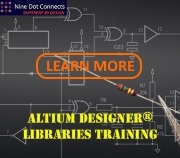 Altium Designer Libraries – This training teaches Altium Designer users how to create basic schematic component libraries (.SchLib) and associated printed circuit board footprint libraries (.PcbLib). Students will also learn how to create Library Projects (.LibPkg), Integrated Libraries (.IntLib) and Database Libraries (.DbLib). 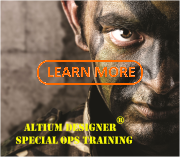 Altium Designer Spec Ops – This is a follow on course to the Altium Boot Camp. However, this is not just another round of learning more features. This class has been specifically designed to demonstrate methods and practices to help make the PCB process more efficient and practical within Altium Designer. Altium Designer 18 like many CAD tools in its price range has many complicated features that most designers will never use, but with this class I feel confident that my learning curve will be quicker and easier. I attended the combined Boot Camp and Spec Ops class and found the training to be excellent! The instructor was not only a well outstanding instructor, but also a well experience design engineer with years of Altium Designer background. He was able to deliver the course content, but also to make sure I was able to fully understand the topics and how they related to my work. I would strongly recommend training from Nine Dot Connects to anyone thinking about improving their skills. 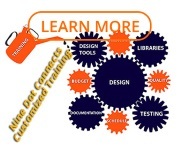 Training on Altium Designer with Nine Dot Connects is always a truly enlightening experience. Their comprehensive, hands-on approach ensures that you immerse yourself into some of the most advanced topics of Altium. The free webinars offer critical information and design techniques that are invaluable to anyone wishing to expand their knowledge of Altium. Their highly proficient and adept staff provides you with the knowledge and wisdom you need to tackle today's electrical design challenges. 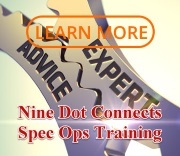 I highly recommend training with Nine Dot Connects! Dan provided the Altium Designer Boot Camp private onsite training and he is an excellent instructor. He was successful at keeping the entire class engaged and while working through the exercises he worked with us on an individual basis. I thoroughly enjoyed this training class. One of the best classes I have ever attended. My goal for attending the class was to be able to understand how everything fits together and have the ability to incorporate part changes as the product matures. I feel I have a good understanding of the material as it relates to my job function.